here is my entry: Decided i wanted to do a BOB hurricane ace so i found a techmond sheet at a show/contest last week and will do Witold Urbanowicz's hurricane (middle aircraft on the decal sheet shown below) i believe the leading polish hurricane ace. I built exactly the same one for Airfix IV campaign I will follow your build with interest. 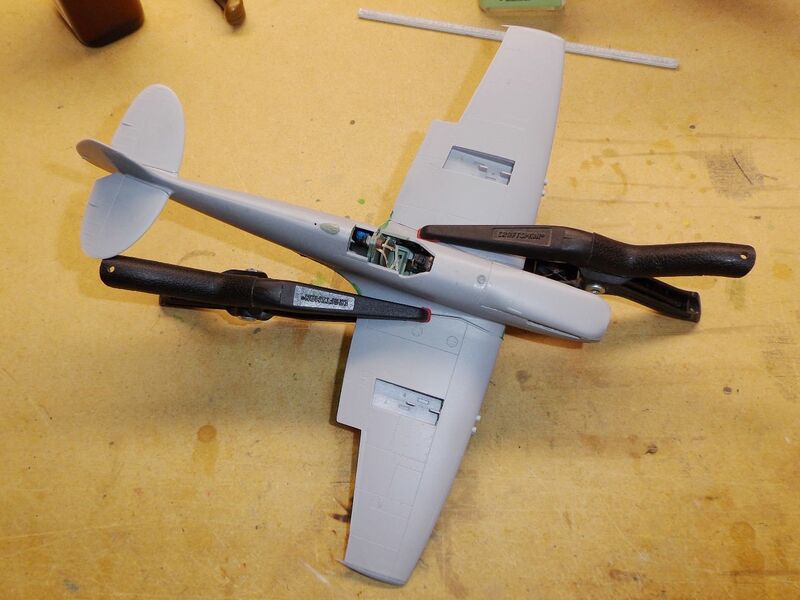 I started to put the fuselage halves together - just the small strip forward of the cockpit and behind the engine. I did it this way so the halves would be together to accept the engine and then cockpit but still allow some wiggle room to fit things. All was going well as I put the engine and bulkhead in. Then I figured I see how the top cover for the engine fit. Ha! Friggin' thing won't fit over the engine. I really don't believe I misplaced any parts. So...an engineless Spit. I can get the necessary parts in there to support the propeller and exhausts and keep the shape correct, so give ICM some engineering credit (maybe about 14%?). Yeah, I'm pretty torqued about it. It almost crash landed in the roundfile. So...seek a different Spitfire Mk. IX than this one. Mike, Sorry for the Gremlins in that kit. Hi Mike I've built the kit and from memory leaving the rocker covers off allows you to put the top cover on at least it did for my build. But the majority of the engine is there for exhausts props etc. I'd heard that the cowls didn't fit around the motor so I'd built the motor without rocker covers since I wasn't going to do a diorama. 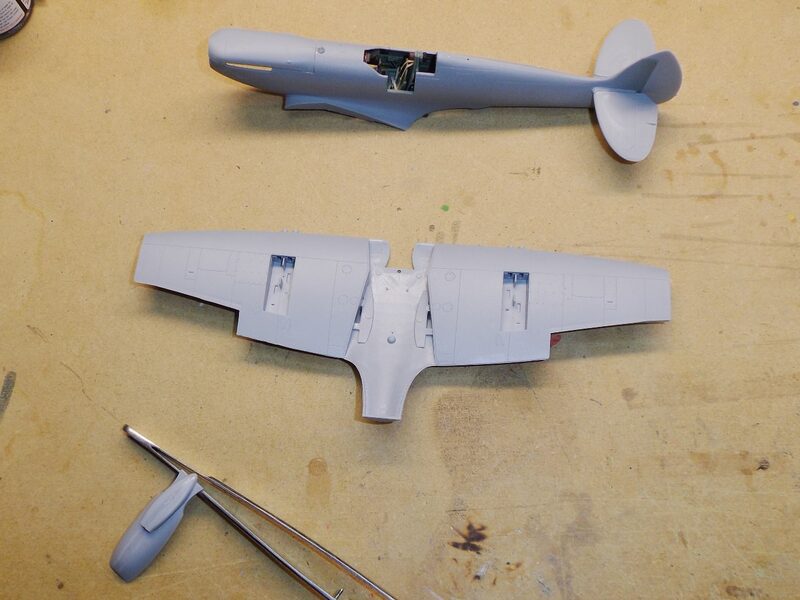 Fuselage together and beginning of the wings. I like the "chopped" look to the wing tips. Coming along Mike, I'm watching from the side line as apart from being able to stick bits together at two shows I'm attending this month, my work schedule will not see me get to the bench. I have got to wait until June before I can get any paint down. Nothing much done as I've been working on my Flak Drasine and Mack Cruise-Liner. I did manage to get the "holding frame" built. It's made of thin 1/4"(?) ply that's been laser cut. The base parts fit together pretty good. The uprights had holes cut too small for two of the parts to fit so I had to sand them a bit to get them together. 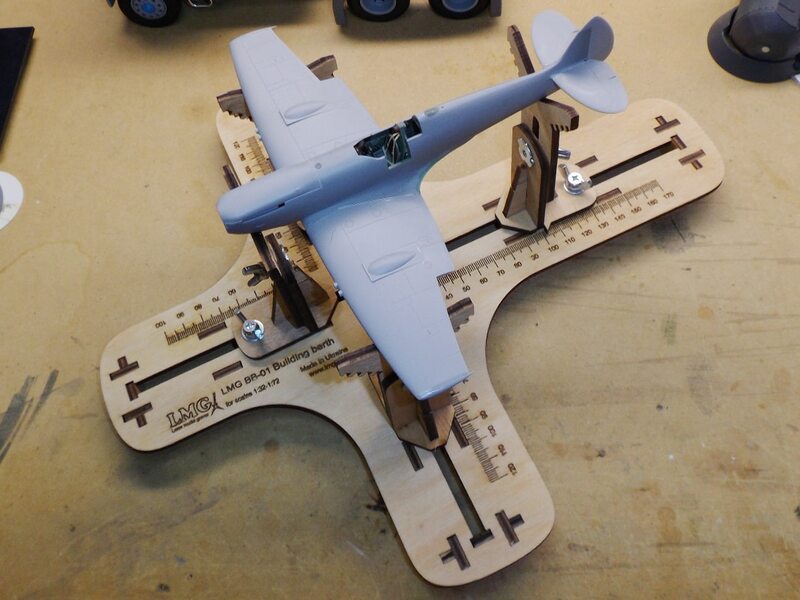 Seems useful - at least for keeping an unbuilt plane off the bench. 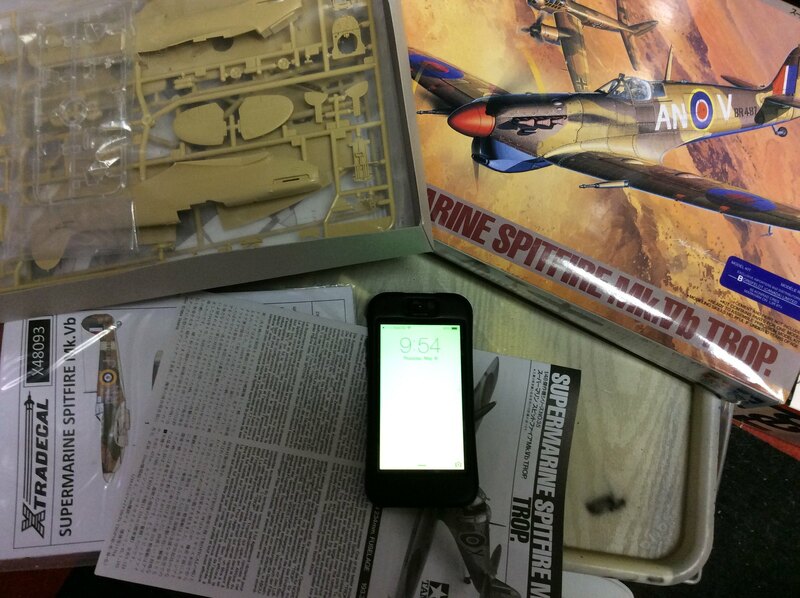 Mike, I am liking your Spitfire progress. Where did you get the stand/cradle? I may want to obtain one. I bought the stand from Hobby.dn.ua. The direct link is here. I can't recall the total cost, but it was quite reasonable. Underside has main color on it. Top surface is now primed. I'm really debating about putting invasion stripes on it. 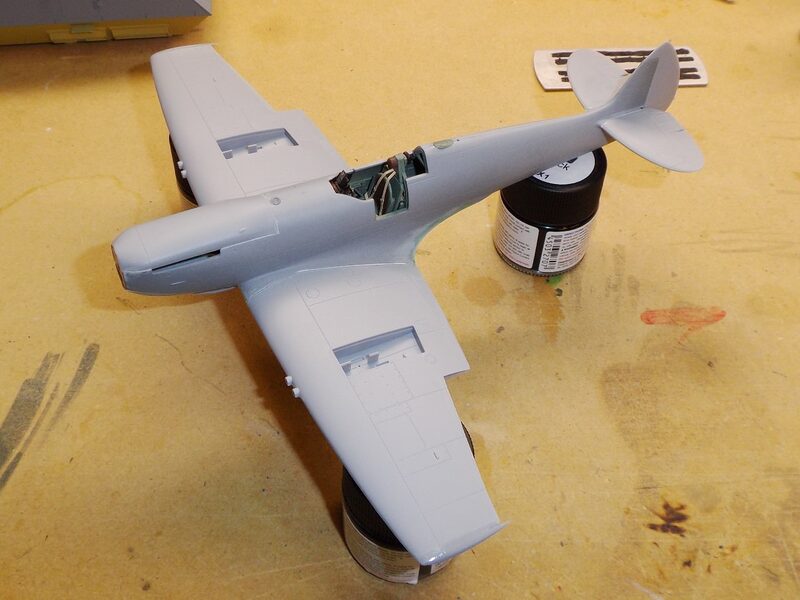 Looking forward to doing the camo on the upper/side surfaces. Lots of Honey-Doo work lately, along with my real job at HD. Bench has been beckoning to me but I've not been able to answer. Yet. why would they mold that in black??? i seen one of these kits at mosquitocon this weekend for $8. i was going to go back and buy it later but couldn't remember which vendor it was at. don't know what happened to my start photo. i guess facebook is not a reliable media to use. i am building a BOB hurricane. i will try to post another photo soon. anyway due to a combination of life and an electrical issue that knocked out the power to my bench area, i was delayed but managed to start last night by flashlight power. i still have no power to use my compressor/ AB and spray booth so i am limited right now. update: i stand corrected. my start up photo is on the third page. i missed it. Here is my entry for the campaign. I have gone back to the beginning for this one. Bought this when it came out. It will be my first rigged bi-plane. I did build an E III for the first Canvas Falcons. Found this little tome the other day for some background. I didn't realise how anti the Admiralty and Army were to a new service. Plenty of politics and pettiness before it got off the ground! Since the SE.5a had been around awhile, to make sure this qualifies I will build this version from the first months of the RAF. Some aftermarket that was released for this kit. I have read mixed reviews about the metal flying wires but I will try them before resorting more likely to EZE line. And the starting gun picture. Hopefully make a start soon. Excellent choice! Even these first WNW kits were a revelation in the modeling community. I immediately ordered two of these and two of the Bristol fighters. I've actually built one of the SE5s. Loved it. It was my first model rigged with EZ line and I still use that. Thanks Michael. Did you post your build on Aeroscale. I went back in the Early Aviation pages to find a build but unless I missed it there doesn't seem to be in the last few years. Michael, I hope you post lots of progress photos, I've got this in my stash and I'm looking forward to getting onto it at some point. Keen to see how you get on. I may have posted it in a Knights of the Sky campaign years ago, but if I did you won't be able to see it as I was using Photobucket at the time (and we all know what happened there). Sorry about that! It was my first WWI subject in many many years, so I suspect you'll do a better job anyway. thanks shrimpman. i found a camo masking templet online and am looking forward to using it. in the mean time got a little work done as seen below. been slow going for me as life gets in the way and i still have not finished redoing my bench area. decided to give the gun bay a try but i want to be able to close it up when i want to so i added some support lips around the opening.the kit supplied panels are too thick though to lay flat and even with the rest of the wing so i may have to thin them. currently working on the seat harness. i am using medical tape for the belts, just have to figure out how to make the buckles and adjusters. anyone out there have any suggestions? Removed by original poster on 06/08/18 - 15:41:44 (GMT). Removed by original poster on 06/08/18 - 15:46:40 (GMT). Removed by original poster on 06/08/18 - 15:48:05 (GMT). been trying to post through facebook and didn't work. can't remember how i did it so i went through flickr. Lots of good progress here! Joe, I do hope you get your photo stuff worked out, I like seeing your work! A quick update! I got the interior colors painted, and am working on the cockpit. So far, this seems to be a nice little kit. Granted I know very little of Spitfire's, except I do like the elegant shape. I punched out, and used Airscale decals for the instruments. I really think they add a bit to the kit. I also hit the interior with a wash of diluted oils (black and brown). I will be installing the "Sutton harness", which will be a challenge for me!